In Marc-Antoine Laugier's Essay on Architecture, the long-standing Vitruvian belief that architecture had its roots in nature was such a matter-of-fact that the book's frontispiece depicted a primitive hut partially made from living trees. 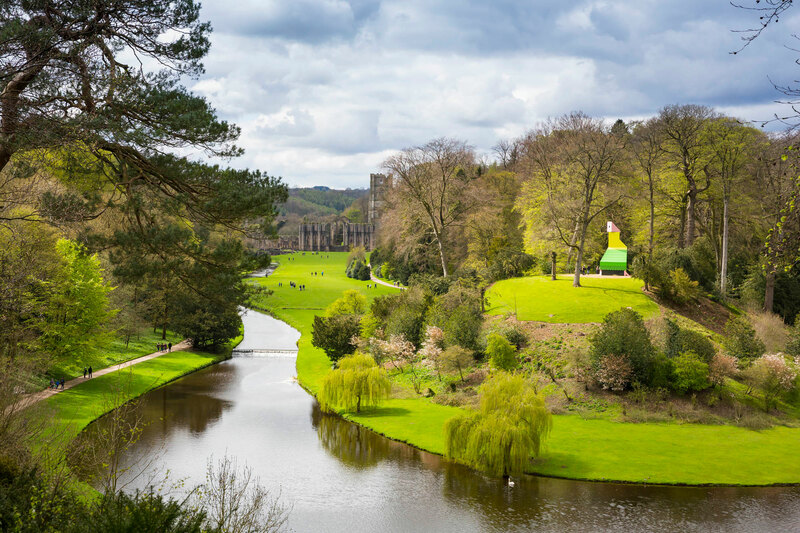 Charles Holland, director and co-founder of British art, design and architecture studio Ordinary Architecture, however, is eager to counter this "myth." 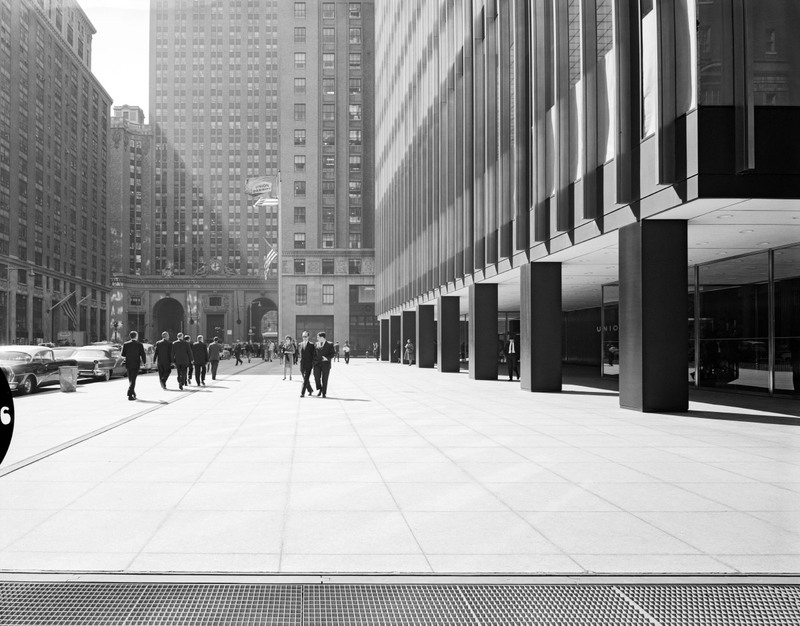 Holland aims to do so with his firm's recently unveiled installation, Foundation Myths. 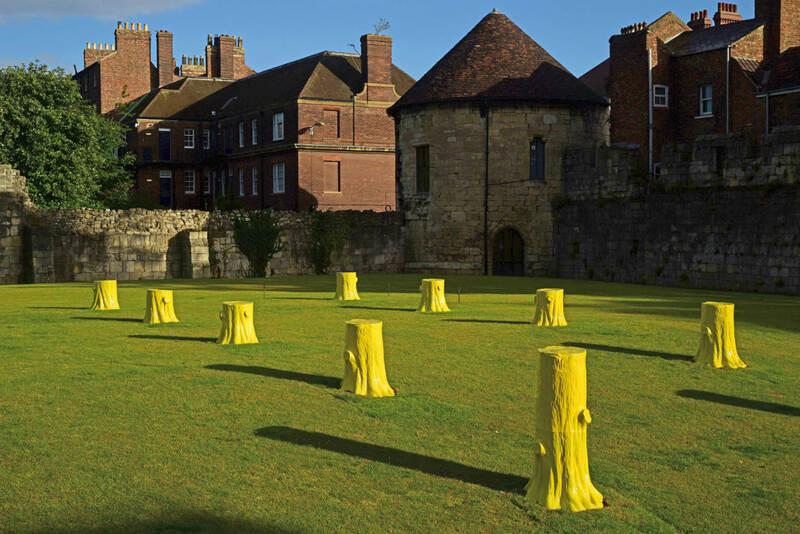 On view at The Artists Garden, part of the York Art Gallery in England, Foundation Myths comprises ten bright yellow ceramic tree trunks laid out in a linear fashion. At first glance, the installation resembles the remaining pedestals of an ancient colonnade. Speaking to The Architect's Newspaper (AN), Holland said the layout also referred to the structural grid of timber columns that composed the now-destroyed "Great Shed," a structure used for the Yorkshire Fine Art and Industrial Exhibition of 1879. Holland spoke of how he and his firm were eager to reference this in their work, especially given that it was the first commission for the gallery setting. "We wanted it to have the characteristic of ruins, meanwhile, the character of the trees befitted the column's structure," Holland explained. "Even when they're growing, they're becoming a column," he added in reference to Laugier and his frontispiece. This may not seem to dispel Laugier's "myth" until you consider Ordinary Architecture's aesthetic and material choices. The bright yellow terra-cotta tree trunks create what Holland described as a "pop-ruin." The yellow—inpsired by the local flowers—causes the installation to stand out (in an explicitly unnatural fashion) from the historic surroundings. As a result, Foundation Myths appears as a "formal ruin" while being materially alien and "clearly new." Additionally, the material choice also makes a nod to the Center of Ceramic Art, a new exhibition space at the York Art Gallery which is the largest of its kind in the U.K.
To create the stumps, Holland and his studio used young beech trees—chosen for their smooth trunks which made them ideal for ceramic casting—as inspiration. A series of maquettes were made, later being scaled up as clay molds. After this, the terra-cotta casts were made and glazed by the ceramic manufacturer Darwen, the same company Holland used for his A House for Essex's ornate terra-cotta facade. Foundation Myths will be on display for one year, running through to August 2017 at the York Art Gallery. A House for Essex then could still one day be awarded the accolade that its fans feel it deserves. Even before it was built, the project was defiant in the face of adversity. During its acquisition of planning approval, members of the public lamented that it was “Better suited to the far or middle east” and that it would “open the flood gates to other avant-garde applications". 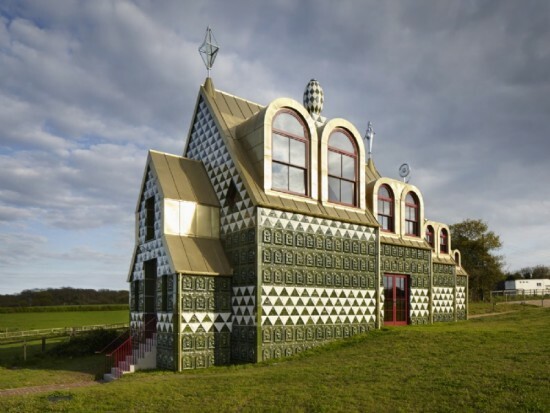 If there was ever a perfect curatorial pairing, Alain de Botton made it when he selected artist Grayson Perry to work with English architects Fashion Architecture Taste (FAT). 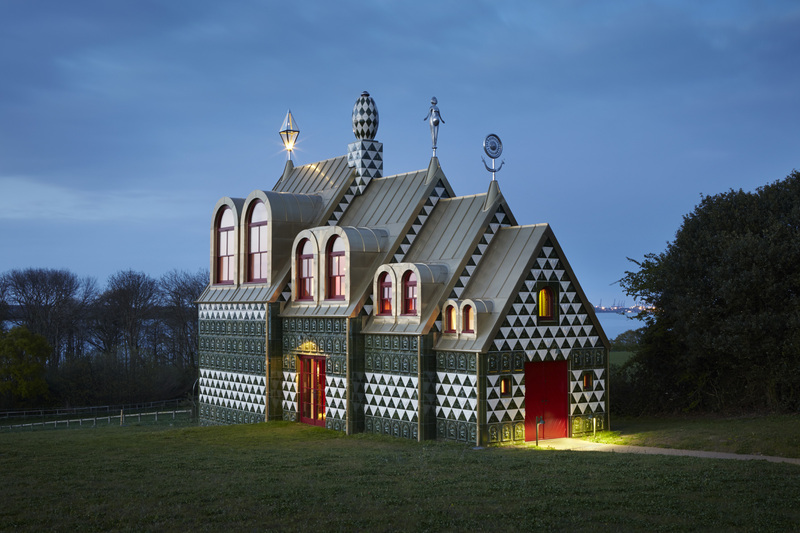 Architecturally speaking, their so-called House for Essex is a “built story”—a shrine to an Essex woman named Julie who led a life as a rock chick and later a social worker, along the way marrying twice and finding happiness before being tragically killed by a curry delivery moped. https://youtu.be/qQ1hbD28KDY The dynamic duo of Perry and FAT's Charles Holland collaborated for almost four years on the artwork and its integration into building form. Perry wrote a long poem about Julie and her life, and how her second husband, Rob, promised to build a Taj Mahal for her if she were to die before him. This is that shrine to her life. Perry had the dream of making a secular shrine, and he first started by sketching his visions of the precious, small temple-like house. “My first ideas looked a bit Hobbity, or like something from Game of Thrones: ramshackle with lots of turrets.” FAT helped make his design, well, less "Hobbity," and incorporate the narrative imagery of Julie’s life and death into the building. They decided on green and white tiles, hand crafted for the building, each of which has an iconographic reference to Julie’s life. While practically every surface is adorned with some of FAT’s most intense detailing, there is a subtle touch that allows the more ordinary features to shine through as a spatial enactment of the narrative. Arched clerestory windows are carved out of a richly painted ceiling; their curved voids contrast, Aalto-like, with the surface of the ceiling. Mustard- and ketchup-colored built-in furnishings are detailed with a level of precision that only FAT could make work without going way over the top. The proportions of the telescoping volumes make the outside like a Russian nesting doll, but inside, the interiors are intensely proportioned to keep up with the visual narrative. The cozy, cathedral-like main space soars above, giving way to a chandelier made from the moped that killed Julie. The bedroom features a 15-foot high tapestry by Perry that looks over visitors, and, depending on one’s own reading, gives approval, disapproval, a cheeky glance, jealous yearning, comforting presence, or complete indifference. Every aspect of the home is meant to have multiple layers meaning, like all of FAT’s projects. 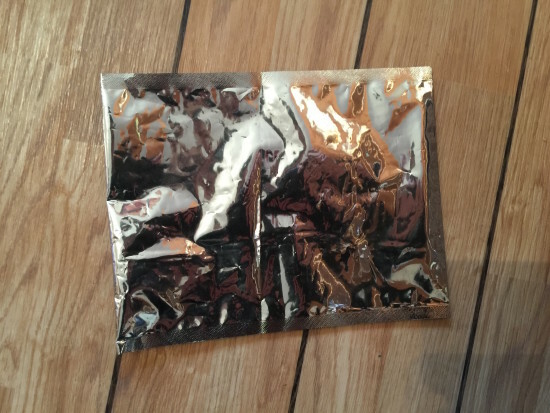 This one just takes the notion a step further than other projects. The house is the sixth installation of de Botton’s Living Architecture program, “a social enterprise…dedicated to the promotion and enjoyment of world-class architecture. It has produced outstanding houses such as MVRDV’s Balancing Barn and the Room for London, a boat by David Kohn and artist Fiona Banner, with Artangel that sits on top of Queen Elizabeth Hall and gives stunning views of central London. The building is the last project for FAT, which disbanded in 2013. The House for Essex has had wide-ranging coverage in the UK, including an hour-long special on Channel 4, which got good reviews. More information is available at the Guardian. Perry also gave an interactive tour of the house here, and it is a must-watch.